It’s all aboard for Whyalla as some of the best model railways go on show this month in the city. The Whyalla Model Railway Society is holding its first exhibition since 2000 over the weekend of October 27 and 28. Some of the best models from South Australia and Interstate will be on show along with trade stores and static displays at the Whyalla 2018 Model Railway Exhibition. Club President Geoff Buckland said the exhibition, to be held at Samaritan College, is part of the celebrations it is holding to mark the society’s 50 years of continuous operation. It will also be the society’s contribution to Whyalla Pride Week and many of the exhibitors are planning to stay in Whyalla for extra time to have a look at what the city has to offer. “There will be competitions with great prizes for the children on both days and the public will be encouraged to cast a vote for their favourite layout,” Geoff said. City of Whyalla Events and Tourism Officer, Rebecca Neilson said Council was proudly supporting the Whyalla 2018 Model Railway Exhibition. The society applied for a community grant with Council and received $2000 towards the running of the event. “There are a lot of model train enthusiasts around the country and these exhibitions are very popular,” Rebecca said. “A lot of people travel all over the country to see these displays and Whyalla can expect to see an influx of visitors for this event. Geoff said the model railroading hobby is flourishing with exhibitions around Australia attracting more and more people each year. 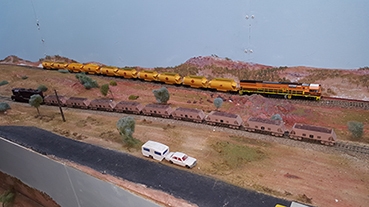 The Whyalla Model Railway Society’s railway at the Maritime Museum is one of the best in the country and it maintains and operates a large layout at it Fisk Street clubrooms. “With the new technology and vastly improved detailing available on models today, far more realistic layouts can be created,” Geoff said. “There are many different aspects to the hobby, from the electrical control systems to the landscaping and creation of the building and structures that go to bring the overall layout to life. The Whyalla 2018 Model Railway Exhibition runs from 10am-5pm on Saturday, October 27 and 10am to 3pm on Sunday, October 28 at the Samaritan College Gymnasium on the corner of Norrie and Gowrie avenues. Entry for adults is $10, concession $8, children $5 (under-5s free) with a family pass available for $25. More information can be found on the society’s Facebook page or by contacting secretary Jim Cochrane at secretary-wmrs01@bigpond.com or by phone 0439 653 740. Enquiries can also be made to the Whyalla Visitor Centre and Maritime Museum 1800 088 589.